Usually we search for something when we need to…. ON Demand. This type of search works on the mails you already have in your mailbox. However, in some cases you may want to know everything which is happening about a specific topic, specific person, an ongoing project or a specific type of work you do. The last one is called Color Categories… You can read about them in this article. In this case, you want Outlook to automatically search for the area of interest on an ongoing basis. This is called search folders. 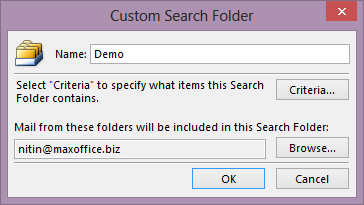 You specify what you want to search for and Outlook will create a special folder which contains the search results. 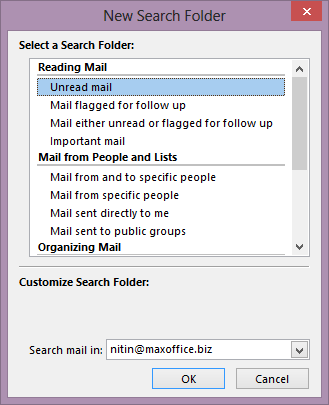 When you receive more mails in future, Outlook will automatically search and update the folder. This is called a Search Folder. How to create a Search Folder? It shows some common search conditions. Scroll down and choose Custom to create a new type of search. Click Choose… button. Now specify a name and click on Criteria… button. Now the Advanced search dialog opens. This dialog has lots of options.. it looks inundating. But don’t worry… it is very powerful. Explore the More Choices tab to understand all available options. For illustration purpose, I have chosen many options here. Don’t get put off by the Advanced tab. This dialog gives you access to all fields. And trust me.. there are many many fields. Open the Field dropdown to see for yourself. I know this is a bit inundating… but look at it from another point of view… Microsoft has thought of even the smallest possible needs which we may have. 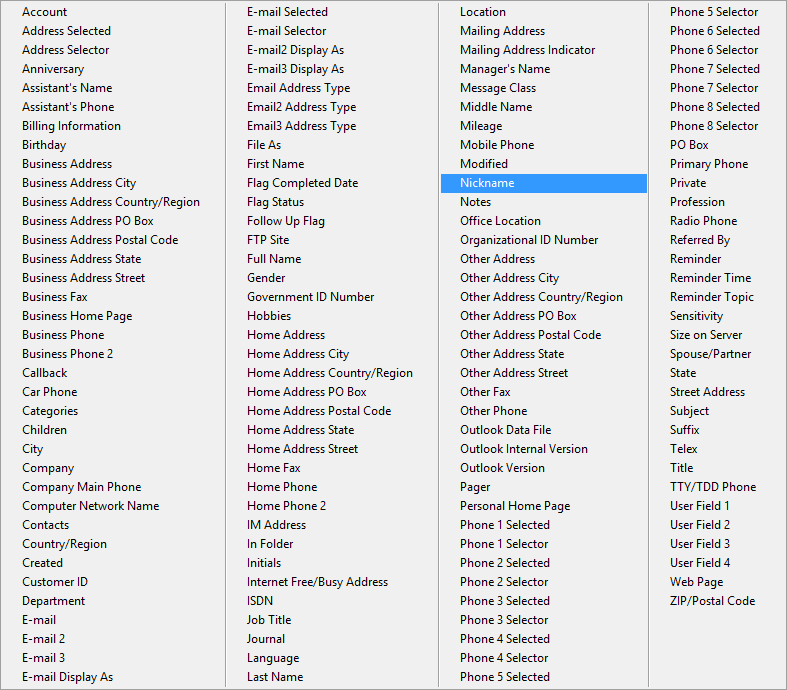 You need not use all these fields. But now you KNOW that if you need them they are available! Finally, click OK to create the search Folder. 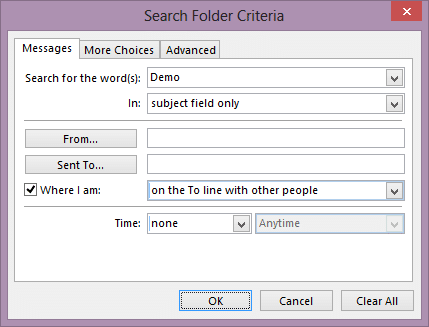 Now you can just click on the Demo folder to see all the mails which satisfy the search criteria. Clicking on the folder is as good as going to Search textbox and adding all those criteria. Now it has become much simpler for you… just ONE click. Of course the same message may be in Inbox or other folders. 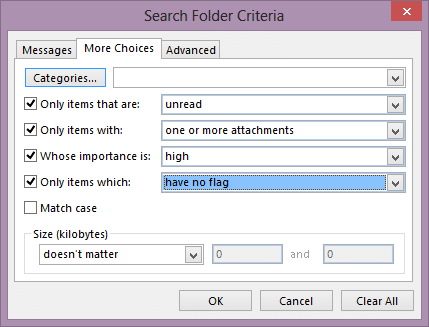 Search folder just DISPLAYS the message which meet the search criteria. It does not make a copy of these messages. Therefore, you don’t have to worry about the Search folders consuming space in your mailbox. The search results are segregated by folder location for your convenience. Of course you can customize the view to suit your needs. What type of searches are good candidates for Search Folders? Search folders based upon color categories are a good idea. Filtering on mails related to a specific customer, project or topic is another common usage scenario. Sometimes just searching on a particular word may be useful. For example, you want to search for all resumes – Search on the word Resume and add one more condition – Has an attachment. This is a very useful features. Go ahead and refine your search. Do let me know if you create some interesting search folders you create in your work context. 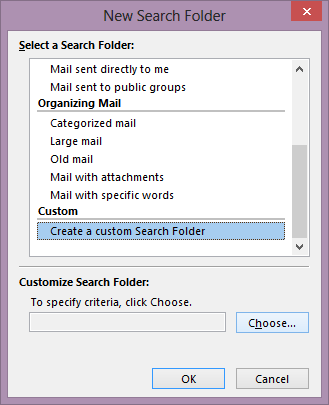 Do you know if using many search folders will slow down outlook? In other words, do saved searches re-scan all the time or are smart enough to just apply changes? Like if we go from folders to categories and just use saved searches to give us ‘folder-like’ category views, will that be more cpu-intensive than just having the items in folders? 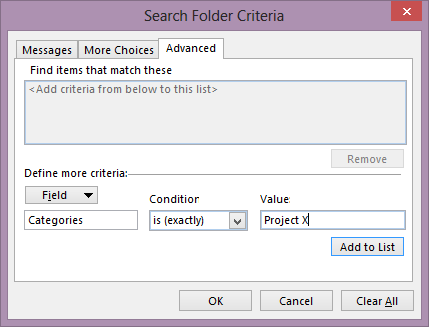 Search folders will take up resources at the time of creation because they have to run a search on existing items. However, this is done using Indexing Service. Therefore, it is fast and does not cause any overhead. On an ongoing basis, any new item is scanned online by indexing service routinely. In the presence of one or more search folders, the indexing service just checks if the currently indexed item is applicable and updates the search folder filter list. Therefore, there is no significant overhead involved. That helps. Thanks for the reply. I enjoy your blog.